The Home-Run Platform in Melee. The Home-Run Contest (ホームランコンテスト, Home-Run Contest) is a minigame in Super Smash Bros. Melee, Super Smash Bros. Brawl, and Super Smash Bros. 4 in which the player(s) must knock a Sandbag as far as possible, usually with the Home-Run Bat given. The player has ten seconds to rack up damage to lengthen the home-run. The most effective technique for dealing high damage very quickly is known as bat dropping. The minigame takes place in the Home-Run Stadium, a unique stage otherwise inaccessible in other game modes without hacking. Zero Suit Samus is ready to send Sandbag flying in Super Smash Bros. for Wii U. The player starts on a platform with a Sandbag in the center, and the character about 1/3 of the way from the left of the platform facing right. On the left edge is a Home-Run Bat, which can be used to hit the bag extremely far. Hitting with the very end of the bat, known as a "tipper", makes Sandbag go farther than hitting with the middle of the bat, which goes farther than a close hit. Halfway through the game, the announcer will start the countdown just like In a standard timed match with only five seconds remaining before the player hits the bag with the bat or an attack. When the Sandbag lands on the field, that will be the player's total distance for the game. In Melee, it is also possible for some characters to hit the Sandbag with the handle of the bat, causing what is known as a no-ping hit, which sends the Sandbag at a much sharper angle. A no-ping hit only does 8% damage rather than 20%, but the change in angle causes the Sandbag to fly much farther when its damage is relatively low (lower than about 120%). For example, using a no-ping hit when Sandbag is only at 35% damage sends the Sandbag over 1000 feet (304.8 meters). Pichu, Pikachu, and Mr. Game & Watch can take advantage of their unique swing animations to perform a no-ping hit simply by walking next to the bag, facing away, and swinging. Most other characters require the bag to be in the air to perform a no-ping hit. The characters that cannot do a no-ping hit or it does not go farther than their normal Home-Run swing at any percent are Dr. Mario, Mario, Luigi, Donkey Kong, Captain Falcon, and Ganondorf. It is currently undocumented whether or not no-ping hits are possible in Brawl or whether they have similar uses as in Melee; the fact that all characters' Home-Run swings have been standardized to a single unique animation may be relevant. 2-player Co-Op is now supported, both in simultaneous and alternating modes and can also be played online with a friend. There is a shield around the platform which prevents Sandbag from being knocked out without sufficient force. The shield is breakable after being struck enough times (usually up to five times) or with sufficient force, but it greatly lowers the difficulty of bringing Sandbag's damage up. The shield automatically disappears when time is up. Bat drops are generally more difficult to do because A and C-Stick grab items. Knocking Sandbag to the platform's left will automatically result in no distance. A small tune is now played for the duration of the game. The Home-Run Stadium is endless; the measuring counter, however, cannot exceed 999999.9 ft.
At 10000 ft, the number on the sign will wrap around to 0. Additionally, the Home-Run Bat sports its own unique Smash attack animations, allowing Captain Falcon and Sheik to properly use it for the contest. The barrier is no longer breakable by being hit weakly multiple times, it now must be hit with sufficient force to break. In Super Smash Bros. for Wii U only, the Home-Run Contest is now playable with up to four players by taking turns. The playing order is random. Hitting the Sandbag far enough will cause the gameplay to fast-forward until it becomes visible again. The Sandbag has more traction. The total distance is now shown with Global Smash Power. Luigi's Green Missile can never misfire. Peach can only pluck the dot-eyes Vegetable. Mr. Game & Watch's Judge always comes up with a 6. Olimar starts with 3 purple Pikmin. Villager's up and down aerials always throw three turnips. Duck Hunt's Wild Gunman always summons the leader. Timber always spawns a log. Due to differences in knockback scaling, certain moves can send the Sandbag farther than a Home-Run swing once the Sandbag's accumulated damage has become high enough. Exact damage thresholds for some moves are unknown and are only given as bounded ranges. For example if a move is listed as outperforming the Home-Run swing after "100% - 200%", the Home-Run swing is confirmed to be better at 99% or lower, and the other move is confirmed to be better at 200% or higher, but it is not known which move is better between these two numbers and the actual threshold may be as low as 100% or as high as 200%. The following lists only include moves potentially viable for record strategies; for example, moves that would require an unreachably high damage to outperform the Home-Run Bat are not listed, nor are moves that could outperform the Home-Run Bat but would always be outclassed by another move by that point. Ganondorf Warlock Punch (sweetspotted) 76% 34% The very top of Warlock Punch's hitbox (near Ganondorf's head) does more damage and significantly more knockback. Usually performed by jumping and throwing the bat upwards above Sandbag, then pressing B while landing on the opposite side of Sandbag. When timed properly, the falling bat should knock Sandbag into the top of the punch's hitbox. Generally known in the HRC community as the "Reverse Warlock Punch" since Ganondorf faces away from the Sandbag as the move is performed (not to be confused with the maneuver introduced in Brawl where Ganondorf actually turns around in the middle of the windup). Without the sweetspot, the regular Warlock Punch does 30% damage and only outperforms the Home-Run Bat at 154%. Peach Vegetable: Bob-omb (1/300 chance; smash thrown down) 90% 38% Peach should face left and away from the Sandbag while smash throwing the Bob-omb down. Luigi Green Missile (misfire, 1/8 chance) 269% - 310% 25% Luigi can only inflict this much damage to the Sandbag through TAS. Any Smash throwing the bat down 345% - 406% 12-13% The only character legitimately able to do this much damage to the Sandbag before the final hit is the Ice Climbers through the freeze glitch. Ike Forward smash (fully charged; sweetspotted) 127% - 154% 31-32% The sweetspot is at the center of the blade (as opposed to the tip or the hilt). Eruption (Stage 8) 208% upper bound 39.5% Ike's Eruption reaches Stage 8 when released 1 frame before becoming fully charged. Forward smash (fully charged) ~250% - 399% 26% Reaching this much damage requires a co-op partner or TAS. Up smash (fully charged) 700% lower bound 26% Reaching this much damage requires TAS. Oil Panic (capped)  63% This requires a co-op partner. Down smash (sweetspot; fully charged) 203% - 246% 25% The move's knockback hits the target upwards and towards Donkey Kong, so it must be performed while standing to the right of the Sandbag to hit it to the right. The move has a sweetspot on Donkey Kong's hands/fists and a sourspot on his arms. Giant Punch (stage 10; sweetspotted) 392% - 396% 29-32% Racking up this much damage to the Sandbag requires a co-op partner. Giant Punch has 11 stages of charging (one for each swing of his arm) with the 11th being fully charged; the 10th stage has the greatest knockback. When not fully charged, the move also has a sweetspot at the body of the punch (approximately at Donkey Kong's elbow) that deals even more knockback and sends the target behind Donkey Kong (therefore Donkey Kong must face left while performing this move). Bowser Forward smash (fully charged) 192% upper bound 48% (both hits) Connecting both hits with the Sandbag at heavy damage requires that the Sandbag be moving during the smash; this usually involves a previous move, a falling thrown bat, the barrier, or some combination of all three. If only the second (stronger) hit connects, the move does 31% damage and only outperforms the Home-Run Bat at an upper bound of 267% and a lower bound of 198%. Down smash (fully charged) 405% - ~867% Reaching this much damage requires a co-op partner. Multiple Smash throwing the bat up 359% - 371% 25-26% The only solo character able to deal this much damage to the Sandbag in real time is the Ice Climbers. Other characters can pull this off in co-op mode or by using TAS. Not all characters can hit a grounded Sandbag with an up throw while standing next to it. 12,500 meters/37,500 feet total: Ai no Uta (French Version) music track - if not obtained, nothing appears. Since almost the beginning of Super Smash Bros. Melee, Home-Run Contest has been played competitively. Originally, before the game's release in Europe, North America and Japan had a competition between each other for the highest Home-Run Contest scores. This then moved out to include Europe when the game was released in its PAL version. This competitive nature has continued and grown onto Super Smash Bros. Brawl and both versions of Super Smash Bros. 4, especially due to the replay function (thus making video production easier) and video streaming sites such as YouTube. However, due to the large technique changes from game to game, most notably the introduction of the barrier and multiple bat drops in one jump in Brawl, there is very little player overlap between games. The Home-Run Contest world record's list is maintained on the smash site AllIsBrawl currently but with members of the stadium community questioning the site's support for stadium, the location might change to a more stadium based site. A history of Home-Run Contest and its milestones up until about 2005 can be found on the site Folderol, but note that the Home-Run Contest record's list is out of date. The Home-Run Contest was notably played competitively during the 2017 Nintendo World Championships. NBA: No Bat Allowed. The bat cannot be used to attack in any way. The bat can be picked up, as long as it is not used. NBA strategies are usually unique, as it requires a completely different playing style. Bat swing cannot be used. NBD: No Bat Drops. Players can do everything except aerial bat drops. Grounded bat drops are allowed, as it is considered a bat discard. Bat swing may be used. BMO: B Moves Only. Only B Moves are allowed, and the last attack to hit Sandbag must be a B move. The bat can be used, so somewhat unique bat drops are utilized. Bat swing cannot be used, as it counts as a forward smash. In Brawl with the advent of the barrier, the record strategies for this subcategory have mostly turned into multiple bat drops with a single B move used to finish, which some argue is against the category's original purpose. NJA: No Jump Allowed. Players may not jump at any time. NSA: No Shield Allowed. Originally called "No Barrier Allowed". The Sandbag cannot bounce off the barrier. 3SS: Three Smash Strategy. Players must use all three of the character's smashes (forward, up and down). AAA: All Aerial Moves. Players must use all five of the character's aerial attacks. Ganondorf and the Ice Climbers are tied for the world record of 11,347.2 feet (3458.5 meters). By hacking the game to remove the distance limitation, it can be seen that the Ice Climbers' world record would otherwise be 25,542.3 feet (in real time) or 80,046.7 feet (through TAS). Over-limit distance numbers for Ganondorf and Peach are currently undocumented. The solo world record is held by the Ice Climbers at 21,083.3 feet (6,426.2 meters) by YouTube user Teitoku06142 , performed by trapping the Sandbag underneath the lip of the platform, then keeping it stuck there with freeze frames while Popo and Nana alternate bat throws twice as fast as any other character can. Excluding off-stage mechanics, the solo world record is held by Ganondorf, at 12,059.7 feet (3,675.8 meters), by YouTube user Pokitaru2681 . The co-operative world record is held by Ike and the Ice Climbers at 114,594.8 feet (34,928.5 meters), by YouTube user Teitoku06142 . With TAS, the solo world record is held by Peach at 59,455.7 feet (18,122.1 meters), by YouTube user timi1016 . With TAS, the co-op world record is held by Ike and Mario at 114,838.3 feet (35,002.7 meters), by YouTube user ShoPuyo . Although the Sandbag does not reach the damage cap, Mario's cape amplifies the knockback to send the bag farther; this is currently the known maximum possible distance. Excluding off-stage mechanics, the TAS co-op world record is held by Ike and Peach at 114,723.7 feet (34,967.8 meters), by YouTube user LPZampa . The Sandbag reaches 999% damage while there are still over 4 seconds left on the clock, and a finisher with the strongest known hitbox (stage 8 Eruption) is used to send the bag flying. Mario is ready to swing the bat to send Sandbag flying in Melee. Mario hitting Sandbag with a Home-Run Bat in Brawl. Mii Brawler participating in the contest in Super Smash Bros. for Nintendo 3DS. In Melee, there is a wall approximately 50 feet/15 metres to the left of the platform (off screen) that Sandbag can bounce off of. Sandbag's position and scale are identical between versions while the platform's scale isn't, proving the US version has a smaller platform. In the NTSC version of Melee, the distance counter will stop at 9999.9 feet as it has run out of digits. However, values beyond this are still properly recorded under each characters' high score. Four characters, Ganondorf, the Ice Climbers, Captain Falcon, and Peach, can exceed 10,000 feet in Melee. Of these, Ganondorf is the only one that can do so in real time without using a glitch. The Ice Climbers require using the freeze glitch, while Captain Falcon and Peach require TAS to pull off their strategies, and so they cannot reasonably be performed in real time. In Brawl, the stage is composed of a unique terrain type designed so that Olimar can only get Purple Pikmin. This is likely so that Olimar players would not constantly restart to get a Purple at an opportune moment, as the mechanics of the mode cause Purples to be the most useful Pikmin almost without question. Even in Smash 4, where terrain no longer affects Pikmin plucking and they are normally plucked in a fixed order, Olimar still begins with three Purple Pikmin. Smash 4 would go on to introduce additional mechanics to reduce randomness. In Brawl, the highest number the distance counter can reach is 999,999.9, only visible with hacks. If the Sandbag is hit this far, it can also be seen that the signs on the ground start getting pushed along with the camera. 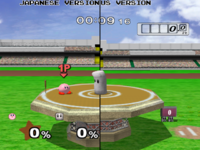 In Brawl's co-op Home-Run Contest, it is possible to view the area to the left of the main platform. This can be done by having one player hit Sandbag off the platform, then having the other player send Sandbag flying to the left of the stage with the Home-Run Bat; the camera will continue to follow Sandbag, showing the backside of the stage, as well as its "end" if Sandbag is hit far enough. Some tickets in Master Orders involve reaching a certain distance in the Home-Run Contest. These tickets allow custom moves to be used (and used to allow equipment as well until version 1.0.8), something that is not normally possible when playing the Home-Run Contest. If Mr. Game & Watch uses Extreme Judge (which normally only lands on 1 or 9), it will be changed to regular Judge and always land a 6 as usual. In Super Smash Bros. for Nintendo 3DS, attacks that usually cause a "screen-shaking" effect will not shake the screen while in the Home-Run Contest stadium. The same goes for the Target Blast stadium. While the Home-Run contest doesn't return in Super Smash Bros. Ultimate, the sandbag's spirit battle behaves similarly with a still target, a Home-Run Bat, and 10 seconds to hit the target. This page was last edited on February 13, 2019, at 20:56.